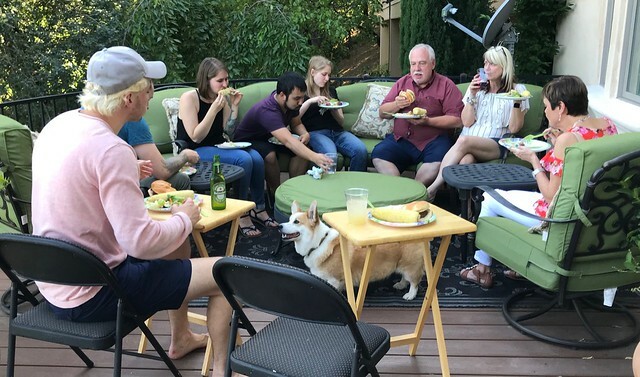 With Jack home for a couple of weeks, Sharon and I decided to host a Memorial Day weekend barbecue. I don't think that we have ever done a family function on Memorial Day weekend. In addition to Sharon, Jack and I, the group included Timmy and Kathy, Eileen and Will, Erin and Cormac, Kevin, Leah and Lydia, Brun and Kim, and Janie. We barbecued hamburgers and corn. We also had green salad, potato salad and macaroni salad. After dinner, the group watched a film that Brun et al made in the 1970s. We finished the evening watching the Cavs beat the Celtics in Boston in game seven of the Eastern Conference NBA finals. On LeBron's back, the Cavs won the game by the score of 87 to 79.